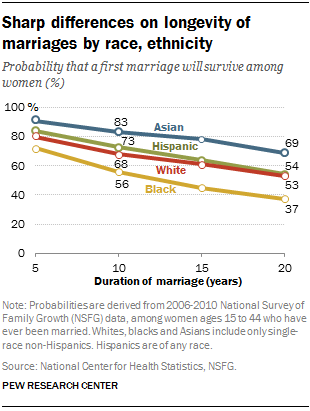 There also are distinctive patterns in marriage longevity by race and ethnicity. Some of these differences could be related to educational differences among adults with different racial or ethnic backgrounds. 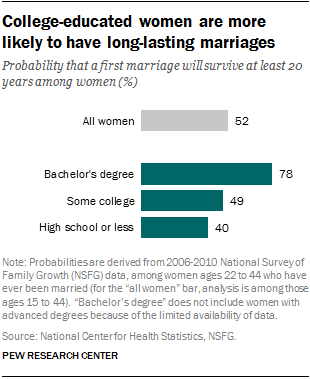 Asian women, who are among the most educated, are more likely than any other racial or ethnic group to have a long-term marriage. For Asian women who were married for the first time between 2006 and 2010, the chance that they may celebrate their 20-year wedding anniversary is nearly 70%. 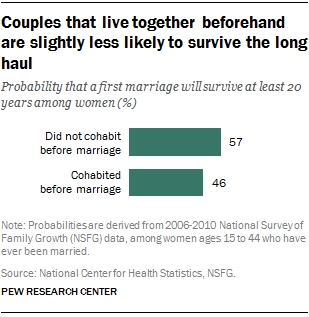 By contrast, about half of Hispanic and white women may see their marriages last that long. And for black women, the chance is 37%.